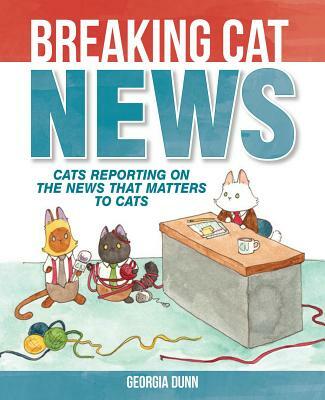 This digital copy of Breaking Cat News by Georgia Dunn was courtesy of NetGalley. How could I have NOT heard of this webcomic before?? I don’t live with cats, but I’m somewhat familiar with them because I have many friends who are cat slaves, and I used to work at the local animal shelter. Georgia Dunn’s cast of three cats – Lupin, Puck and Elvis – report on the hard-hitting issues such as “The People bought some stupid-looking thing for the dining room”, and “The house is under attack from a mysterious red dot”, or “The Woman is trying to use a laptop”. Cue some extremely predictable cat behaviours with deadpan commentary and the seriousness of getting a job done. Bonus points: I’m a journalist… a newspaper one, but a journalist nonetheless and I can relate to the importance of being on top of current issues such as being at the scene where bacon is being cooked or entertaining great suspicion when you are told you’re not allowed to be somewhere. I love this book so hard. I read it at least two more times and bookmarked the website so I can catch up with the latest news, which is further along than where the book ended. I showed this galley and gave the URL to a couple of colleagues who have cats AND a Human Pupa. This is probably my best discovery this month. If you are an animal rescuer or support your animal shelter, the reporter cats have a wonderful Special Report on shelter cats which is worth passing along. You can find Breaking News Cats here.